Bread, cured meats, and pizza account for about 65% of the salt consumed in most people’s diets, with bread coming in 1st place by a healthy margin. Why on earth is bread so high? For one, most people under-estimate how much salt is in bread in the first place. A lot of salt is added to help curb the bitterness in flour, and a single piece of bread often contains 8%-12% of the RDA of sodium. Most bread is consumed in sandwiches, so two servings are being consumed instead of one. And since bread is served at almost every meal……a little adds up to a lot very quickly. In general, avoiding salt is really, really hard. The only surefire way to do it is to stop eating processed food. Period. For most, that’s out of the cards due to inconvenience. Salt is very hard to detect in most foods. 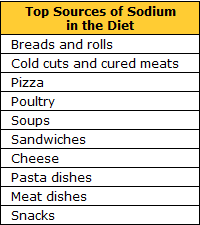 For a lot of dishes it’s added to reduce other unpleasant sensations, so many foods that are very high in sodium don’t taste salty at all. Salt also extends the shelf-life of food, so lots of times even fresh ingredients used by restaurants have already been soaked in a sodium solution by the time it gets to their kitchen. This is especially true for meats. Most surveys done on this sort of thing suggest most people have no idea how much sodium they should and shouldn’t be eating, under estimate how much they salt they consume in a day, and usually fail pretty quickly when they try and cut salt out of their diets without making other radical changes. The somewhat good news is that people’s reactions to salt varies quite a bit. The dietary guidelines are actually just crude approximations. Too much salt is traditionally linked to high blood pressure, but there’s a strong genetic component to the salt/blood pressure relationship, and results vary a lot. But for most people, their salt consumption gets put into overdrive by the time they’re walking and it stays there for a long, long time. Next Post MSG: Is It Bad For You? Why? How? What the Heck Is It?